Hollywood Fountain North is an 89-unit, project-based Section 8 property located in Hollywood, CA for people 62 and over. The waiting list is currently closed. Each one bedroom unit includes a patio/balcony, wall-to-wall carpeting, vinyl flooring, vertical blinds, heating, and air conditioning. The kitchen includes a gas range and oven, refrigerator, garbage disposal and pantry. The spacious community room features a large screen television and exercise equipment for residents to enjoy. 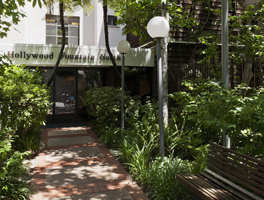 Hollywood Fountain North has on-site laundry facilities and a community kitchen. Resident activities are regularly scheduled and include bi-weekly coffee & travelogue, monthly birthday celebrations and meetings.